If the sensory level is C4, and there is no C5 motor function strength (or strength graded <3), the motor level is C4. 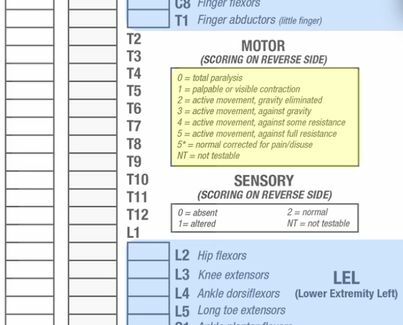 If the sensory level is C4, with C5 key muscle function strength graded as 4, the motor level would be C5 because the strength at C5 is at least 3 with the “muscle function” above considered normal: presumably if there was a C4 key muscle function it would be graded as normal since the sensation at C4 is intact. The Neurological Level of Injury is determined by identifying the most caudal segment of the cord with intact sensation and antigravity muscle function strength (Grade 3 or more) on both sides of the body, provided that there is normal, intact sensory and motor function rostrally (Grade 5). 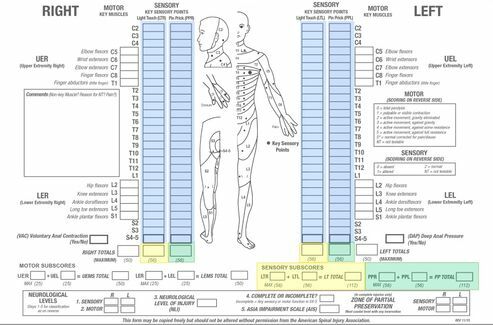 Sensory Level refers to the most caudal, intact dermatome for both light touch and pin-prick sensation (Score = 2). Motor Level refers to the most caudal myotome with a key muscle function of at least Grade 3 on Motor Examination. 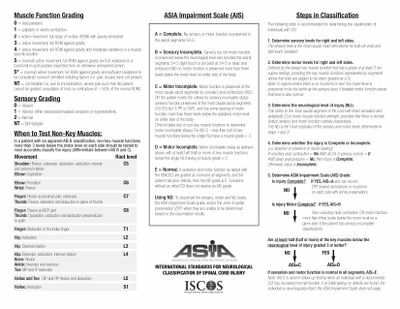 Then the AIS Grade is E.
Someone without a Spinal Cord Injury does not receive an AIS Grade. 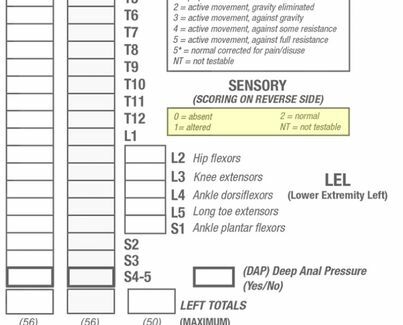 Example; If the left sensory level is C6, and some sensation extends from C7 through T1, then “T1” is recorded in the right sensory ZPP block on the worksheet. The should initially be completed within 72 hours of an acute stage of a spinal cord injury to aid improved prediction of recovery. As such it can be both an uncomfortable and confusing exam for individuals, particular as they have just gone through a significant trauma. Explaining why we do the test and what is it entails is vital to make the individual more comfortable during the exam. 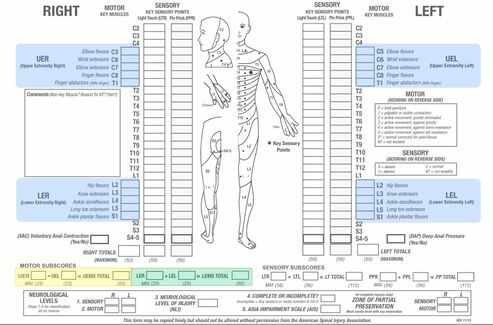 We want individuals to understand that this test will help us as clinicians determine where the injury to the spinal cord is and determine what level the injury was, how severe it is, and an idea of what we could expect in terms of recovery. Often the International Standards for Neurological Classification of Spinal Cord Injury and ASIA Impairment Scale can give us a different picture to what we can see on CT or MRI. ↑ 1.00 1.01 1.02 1.03 1.04 1.05 1.06 1.07 1.08 1.09 1.10 1.11 1.12 1.13 1.14 1.15 Burns S, Biering-Sørensen F, Donovan W, Graves D, Jha A, Johansen M, Jones L, Krassioukov A, Kirshblum, Mulcahey MJ, Schmidt Read M, Waring W. International Standards for Neurological Classification of Spinal Cord Injury, Revised 2011. Top Spinal Cord Inj Rehabil 2012;18(1):85-99. 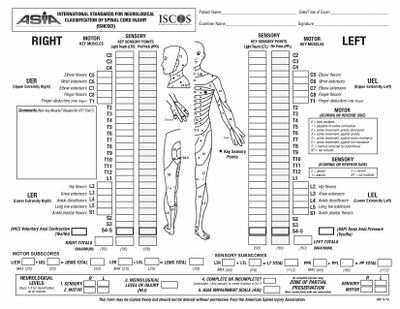 ↑ Schuld C, Franz S, Brüggemann K, Heutehaus L, Weidner N, Kirshblum SC, Rupp R. International Standards for Neurological Classification of Spinal Cord Injury: Impact of the Revised Worksheet (Revision 02/13) on Classification Performance. The Journal of Spinal Cord Medicine. 2016 Sep 2;39(5):504-12. ↑ 7.0 7.1 Graves D, Frankiewicz RG, Donovan WH. Construct validity and dimensional structure of the ASIA motor scale. J Spinal Cord Med 2006;29(1):39-45.